Are you aware of the extreme danger of socket overloading? It’s a frightening fact that socket overloading can be extremely dangerous, yet so many people still insist in carelessly overloading their electrical sockets at home and at work. For the sake of installing a couple of extra sockets or purchasing an extension lead to overcome the problem, is it really worth the risk? Especially when, and believe us when we say that we can confirm, being sensible and reviewing your sockets can save lives! Reasons for overloading your sockets can be down to lack knowledge but often it is because people can’t be bothered to use a bit of common sense. And this means a huge proportion of accidents could be avoided. Are you at risk of overloading your plug sockets in your home or office? Do your sockets need looking ? If so, you are putting your own safety and that of those around you at risk. These sockets have the potential to overload and burn out at any time, proposing a huge fire risk. It’s simply not acceptable. Overloading sockets is dangerous. Rectify the situation immediately. Overloading a socket doesn’t just mean plugging too many appliances into an adapter or socket. It could be the result of the wrong appliances using the same power source that is causing an overloaded. PAT (Portable Appliance Testing) Testing is an easy way to check whether your appliances and sockets are being used safely. For more advice on socket overloading and what to be aware of please visit the Electrical Safety First website. Below is a handy socket overload calculator provided by Electrical Safety First. 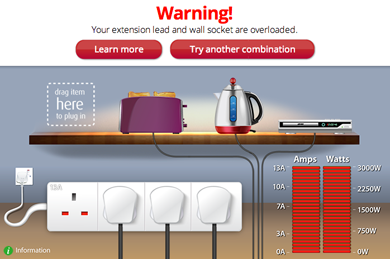 This calculator can determine how loaded your sockets are and how dangerous they could be. It’s a useful exercise that will highlight the importance of being aware of appliances and the potential risks. Introducing a Which? Trusted Trader Day & Knight Electrical Solutions can provide a domestic or commercial review of all your sockets and appliances and conduct a thorough PAT Test examination to make sure you’re safe. We’re proud to have a been a Which? Trusted Trader here at Day & Knight Electrical Solutions. We’ve held the accredited status for several years now and you can publicly read what our existing customers say about us here. Please contact Dave and the team for a free no obligation quote to fix your socket overloading problems on 07792 913566 or complete our email contact form here. This entry was posted in Domestic and tagged day and knight electrics, electrical solutions stafford, Fire Damage Repair Day and Knight Electrics, socket overloading, staffordhire electrician.